The last two days of my life have consisted of TV (preferably the Big Bang Theory or America’s Next Top Model), online shopping and hot beverages, as I have had the flu and been bed-ridden for what seems like weeks. My creativity and ability to get up and move have been severely lacking, so please excuse the late post. Anyway, while doing a large amount of nothing I have read almost every book in my small bedroom bookshelf, and I got very interested in the book my Mother brought me back from America, Ps. I made this by Erica Domesek. It is a book written entirely on DIY fashion/jewelry/accessory projects that are easy to make and inspired by high fashion pieces. 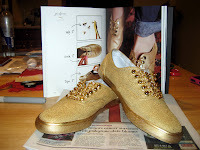 The project that caught my eye the most was the gold oxfords, which are so easy to make and are very on-trend. They would look so cute with my new lace socks. In silver, too. >Thank u for following, I follow back! >love it! gold and silver oxfords are awesome!